Home » Sports » Cricket at the mercy of goons: is this the image the govt wants to project? Sena stormed the BCCI for discussing a series with Pak. Is this the image India wants to project? Bishan Bedi says it's fine not to play cricket with Pak. But then why have diplomatic relations? Only in Mumbai could there have been an invasion of the BCCI premises, in order to stop talks between the Indian board and the Pakistan Cricket Board. This megapolis, advertised as the Maximum City, is exhibiting minimal tolerance and patience, thanks to a ragtag band that rules with fists and sticks, while the administration watches in silence. We were taught to believe that some things were sacrosanct and above politics - at least the playing of sport, if not its administration. Athletes of all races and colours participated, won and lost together. But the politics of Nazi Germany, the 1972 Munich Olympics terror attacks and the boycotts at the 1980 Moscow and 1984 Los Angeles Olympics put paid to that theory. But even then, India was never a victim of such things, till this long-running soap-opera featuring Pakistan, terrorism and cricket rolled about. Now, the ICC has decided to pull out Pakistani umpire Aleem Dar from the current series against South Africa. There is some talk that commentators Wasim Akram and Shoaib Akhtar will follow suit. Is this the ridiculous picture the government and its representatives want to send out, while seeking foreign investment and business for India? It may well be difficult to keep playing when things aren't great. At the moment, in fact, things are terrible between the two nations. If that be the case, then give it up completely. Declare an indefinite moratorium on sporting ties of any kind with Pakistan and be done with it. But no - we continue to leave things open-ended, invite dignitaries and officials from Pakistan, and then have some goons go in and damage property that belongs to all Indians, and also threaten the lives and limbs of fellow countrymen. The attack in Mumbai was the first real blow to the sanctity of sport in India, and that is not acceptable. Few, however, will come out and criticise the goons. 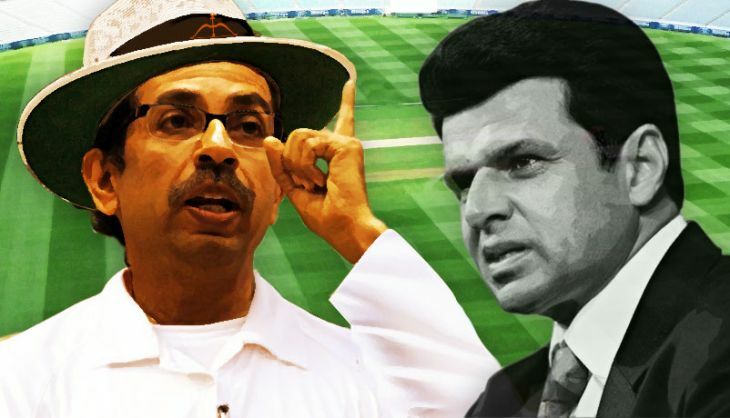 The BCCI is caught in a strange position where the senior officials owe allegiance to the ruling party and, while secretary Anurag Thakur does criticise the Shiv Sena in his response, he still doesn't condemn it completely. He's an MP and simply doesn't have the political licence to do so. No such inhibitions bother the inimitable Bishan Singh Bedi. He is a man who rarely pussyfoots over any issue. "Stupid," is his first reaction to questions regarding the attack. "This is not cricket and it was never about cricket. It is demeaning that the sport would be associated with such activities. You don't want to play cricket with Pakistan? Fine. Then why have diplomatic relations? Why have trade? Why don't you take a complete stand, why drag cricket into it?" Bedi fumes. "Where are we heading? This is not cricket, nor does it concern anything else. How can the whims and fancies of a group be tolerated without any accountability?" Bedi sees the irony too. "These two nations are always at one another's throats, but at the same time, cannot stay away either. If it is such an issue, break off all ties and get this over with," he says. Others are nowhere as forthright. Another former player didn't even want to be identified while declining to comment. "This is a really delicate matter and I wouldn't really like to be involved," he said. The mathematics of an India-Pakistan cricket series isn't something you can ignore. Given that there hasn't been a bilateral series in years, the prospect of a full series is lip-smacking for BCCI. But only if held in India. You would recall how the BCCI tried to get the India rights holders, Star Sports, the licence to telecast the series against Zimbabwe. When it failed, the BCCI sent a second-string outfit. Star would be salivating about an India-Pakistan series in front of its cameras. This is surely one of the reasons that this topic is broached so frequently, despite knowing the fallout well in advance. For the PCB, it is about survival. It doesn't matter how many series Pakistan play in Dubai. It doesn't even matter how high-class the opposition is. The Pakistan board's coffers will only be filled if it gets to play India. So, PCB chairman Shaharyar Khan's ire is understandable. As is his use of the only weapon he has - threatening to pull Pakistan out of next year's ICC World Twenty20 in India. It isn't by sheer chance that India and Pakistan invariably find themselves in the same group in every International Cricket Council event, at any age group. It also isn't a coincidence that on many occasions, it ends up being the first match of the event. And this is the same ICC that shouts from the rooftops about how fixing matches is a bad thing. Nevertheless, the impact of a match between these two countries will always be immense. And full series would be phenomenal. But the ground realities of cross-border terrorism and firing aren't things you can completely ignore either. There is a time when money takes a back seat. Then again, as Bedi says, why go through this rigmarole and end up with similar results? Political bullies are not a new thing in India. Every political party has used muscle power to push its agenda. They do so because they are allowed to by the powers that be. They may think this is enhancing their credentials, but nothing can be further from the truth. Can't we play a game of cricket without someone trying to kill someone else? It really doesn't seem to be bothering them, though. The sheer lack of foresight and a little forward thinking is what this has become. But those who aren't bothered about the present can't possibly be worried about anyone else's future, barring their own. TWEET THIS Sena stormed the BCCI for discussing a series with Pak. Is this the image India wants to project? Bishan Bedi says it's fine not to play cricket with Pak. But then why have diplomatic relations?